The past month or so I have seen some amazing things that have been tagged with the #schnitzelandboominiquiltswap over on Instagram. Well when my friend Kristan from Doodle Do Designs was looking for swap angels, I knew I wanted to help out in any way possible. Once I found out who my partner was, I did some stalking (the curious kind, not the creepy kind) and figured out what I wanted to make her. I actually had 2 ideas in mind, and I am so glad I went with this one. Right after I finished it last night. I used Elizabeth Hartman's Sparkle Punch Quilt tutorial to make this mini. It was super simple to follow and turned out so amazing. I really want to make myself a mini exactly like this one because I love it so much! W is only 2 but I am slowly teaching him to hold quilts for me. Thankfully he thinks that it is lots of fun, and when I asked him to do it this morning he said "ok, sure" it was adorable. Not at all helpful, but super adorable. He has his moments though :) I am so glad I captured this adorable face. I love my little boy and he is growing up way too fast! Finally laying it down proved to be my best bet for a blur free picture. I love the colors in this quilt. I used some of my hoarded stashed Lizzy House Constellations fabric, and her ever useful Pearl Bracelets for the blues and blacks. The yellows are fabrics I had in my stash. I quilted the stars with a yellow variegated thread by Gutermann, and I just outlined the stars shape 1/4" from the seam inside the stars. Then I used a blue variegated thread by Gutermann to quilt straight lines from the points and valleys of all the stars. It was my first time quilting like this, and I love the result. I added 2 little triangles to the corners for her to hang it, and of course it is not until I sit down to write this (and the package is already mailed) that I realize I forgot to label the quilt! I always forget to do that. 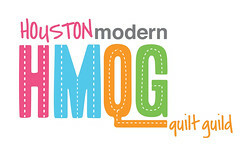 I need a sign to hang on the wall behind my sewing machine that says "Don't Forget to Label That Quilt!" Well that's all from me for now. I'm back to my sewing, also sorry for being a bit absent around here recently, things have been crazy busy with all the sewing I am trying to get done between now and Christmas. Oooo - this is a lovely one! Gorgeous mini! Love the bright colours - and the stars are fabulous! That pic of your little guy with the quilt wrapped around his face is absolutely adorable!! Love this mini and your stitching! Fabulous! I love it! It came out great! beautiful mini, Hilary! The stars look awesome on the dark to light background. Your partner will love it!